This lovely end unit only has neighbors on one side. 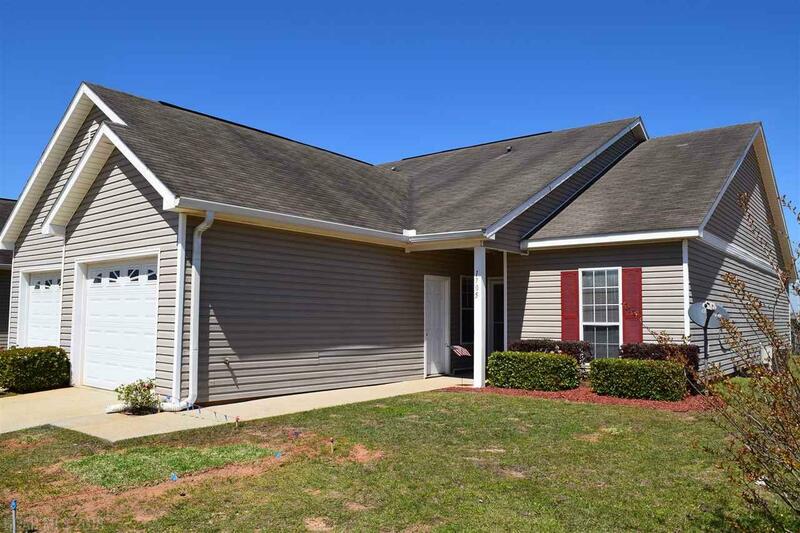 Open floor plan 3 bedroom, 2 bath with screened back porch. Large master bedroom with spacious master bath includes shower, tub and double sinks. Master bath also includes large walk-in closet. Two guestrooms share a bath with large walk-in shower. Kitchen has an island. All kitchen appliances to remain, Refrigerator, Dishwasher, Stove and Microwave. Ceiling fans throughout including back porch. Monthly fees include sprinkler and lawn maintenance, exterior building maintenance, insurance, pest control/termite bond and trash. Convenient to Tanger Outlet Mall, OWA, restaurants and beach express taking you to beautiful Alabama beaches. This unit is priced to sell! All measurement are approximate and should be verified by buyer, and/or buyers agent. Information details are deemed reliable but should be guaranteed by buyer, and/or buyers agent. Bedroom2 Dimensions 11'11" X 11'9"
Bedroom3 Dimensions 11'2"" X 10'9"
Kitchen Dimensions 12' X 11'6"
Master Bedroom Dimensions 13'11" X 12'10"